Campervan hire New Zealand: Surf New Zealand's waves! 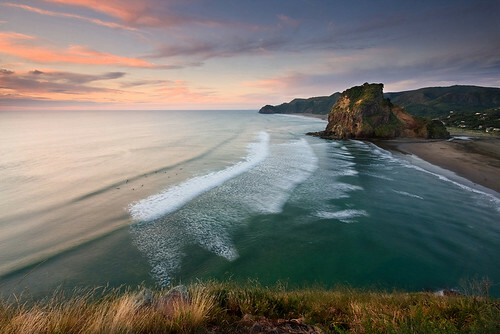 New Zealand has some exceptional surf breaks and beautiful beaches and beach towns to match. Pick up a Campervan and do a tour of the North Island's West Coast beaches with your buddy and your surfboards. Begin the surfie's tiki tour (scenic tour) in Auckland with a campervan and readily waxed boards. If there's only tow of you and you don't mind sharing a bed, you can get some cheap Backpacker campervans, or if there's more of you pick up a 4 berth or even 6 berth vehicle. Take your campervan north and more north (if you want the abridged version road trip skip this part) to Ahipara. It's a 4 hour drive so you could break it up and have a surf at Te Arai (take Mangawhai road turnoff from state highway road about 1 1/2 hours from airport. 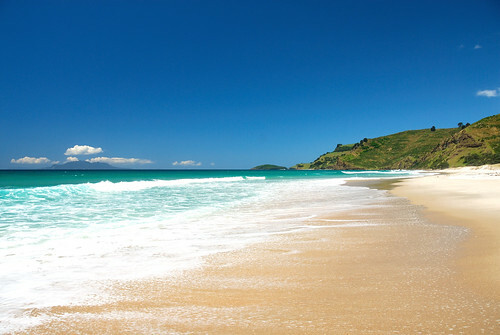 Ahipara, now a three hour drive away, is at the southern end of 90 mile beach on the West coast. It is 14 km from the town of Kaitaia. At the southern end of Ahipara beach is Shipwrecks bay which has has a number of wrecks visible at low tide. The Bay is very popular with surfers and a beautiful place to stay. 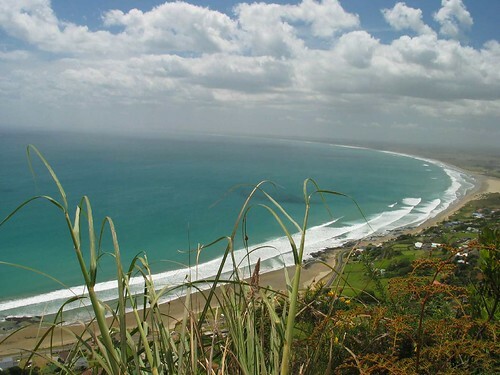 After you've spent some time at Ahipara go for an explore of Ninety mile beach and Cape Reinga. If you've got a 4WD vehicle you'll be able to drive the length of the beach and cruise on to the sand dunes. These are a lot of fun and it's always a highlight to slide down on a bodyboard, tabogan or piece of cardboard. On the way back down to Auckland, stop for a shaka at Pakiri beach surf spot. There's a camping ground there too. If you get sick of surfing for a day you can take a leisurely horse ride. Closer to Auckland is Piha Beach. It's about a 40 minute drive west and don't be suprised (or burn you feet) on the black sands. They are the result of a high iron content, of volcanic origin. 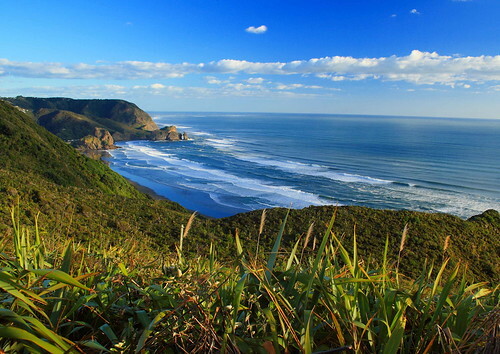 Piha is very popular with surfers and is a notorious beach for big waves. The beach has a couple of convenience shops, a delicious cafe with great coffee, and a camp ground. Spend a couple of days riding Piha's waves before jumping on the road south. 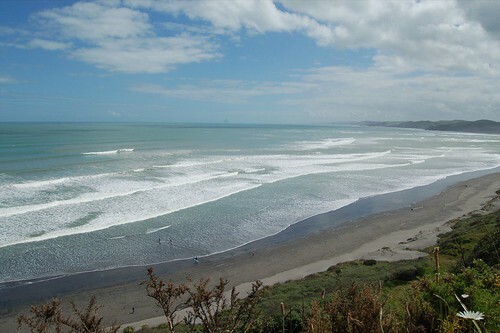 Today you can head to Raglan. This surfie town has an awesome vibe. Jump off the bridge in town and do some bombs into the water, eat and drink at the great eateries in town , play a spot of tennis, hire paddle boards or kayaks and of course head to Manu or Whale Bay. Campervan's are a great way to travel. You can fit your surfboards and take you beds everywhere you go. Stop beach side and pull out your camp stove or if you've got a bigger vehicle cook up a big breakfast in your campervan after the morning's surf . You don't need to have an agenda and can stay as lng or short as you like without having to book motels etc. Campervans are the perfect way for a keen surfie to travel. Be sure to wear lots of sunscreen in Summer, the NZ sun is harsh if you're not prepared. Find the perfect campervan for your surf trip at Campervan Hire Sale finder before they all get booked out for summer!